Ada Louise Huxtable was a renowned architecture critic that wrote many passionate articles fighting for the preservation of architecturally significant buildings in New York City. 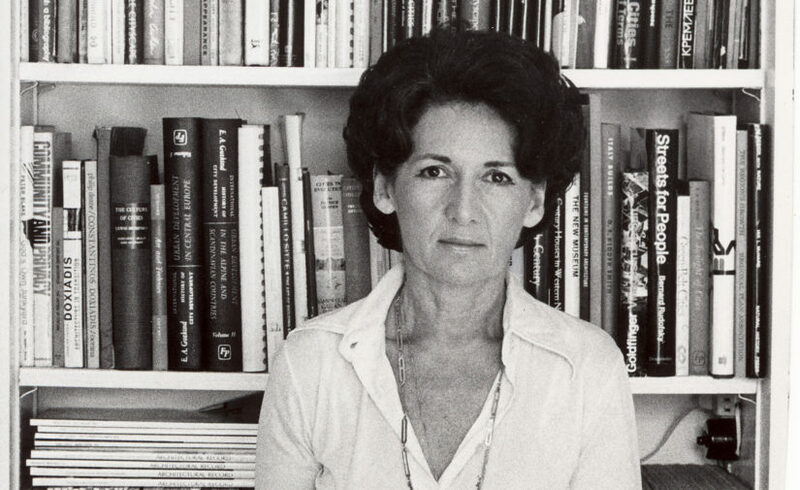 Ada Louise Huxtable, a renowned architecture critic, was born in New York City in 1921. She received an art degree from Hunter College and went on to study at the Institute of Fine Arts of New York University. She began working as the assistant curator of the Architecture and Design Department at the Museum of Modern Art, under Philip Johnson’s tenure, in 1946. In 1959, Huxtable authored her first book, a series of walking tours of modern New York buildings entitled Classic New York and Four Walking Tours of Modern Architecture in New York City. Aside from being a distinguished critic (she was awarded the first Pulitzer Prize for architectural criticism in 1970), Huxtable was also very involved in preservation advocacy.2 Between December 1961 and the passage of the New York City Landmarks Law in 1965, Huxtable wrote over 20 pro-preservation editorials that were invaluable in educating and exciting the public about historic preservation.3 She logged in on numerous preservation controversies, including the demolition of Pennsylvania Station, alterations to Grand Central Terminal, the preservation of Carnegie Hall, and the controversial redesign of 2 Columbus Circle. More recently, Huxtable was the architecture critic for The Wall Street Journal and published her last book—entitled On Architecture: Collected Reflections on a Century of Change—in 2008. Huxtable’s last published article condemned the proposed changes to the New York Public Library building at Fifth Avenue and 42nd Street. Ada Louise Huxtable died on January 7, 2013. She was 91. Huxtable bequeathed her archives and estate to the Getty Research Institute in Los Angeles. Ada Louise Huxtable wrote many passionate and engaging articles fighting for the preservation of architecturally significant buildings in New York City. Many were unsigned editorials written for The New York Times editorial board. Huxtable also advocated for landmarks legislation in New York City. Writing for the editorial board, she explained the basics of and advocated for the creation of the Landmarks Law.7 She explained that the landmarks commission worked on persuasion, and she asserted that this was not a legislative answer.8 She wrote: “Mayor Wagner signed a proclamation establishing 'American Landmarks Preservation Week in New York City' as part of a national and international program to protect landmarks that neither he nor the city has any power to protect. "9 She made the public and government officials aware of the necessity for the Landmarks Law, which was eventually created in April 1965. Furthermore, she argued against the introduction of a $500,000 “sidewalk café” that Huntington Hartford wanted to construct in Central Park.12 She wrote persuasively about the need for parks in New York City, writing “Every Foot of the Park,” which appeared in The New York Times on April 19, 1960. The café proposal was turned down. She also opposed the introduction of a large veterans' memorial at the north end of Union Square Park, raising the important question, “Do private groups, no matter how worthy, have the right freely to propose and carry through public or quasi-public structures of this scale and importance?”13 The veterans' memorial structure was never built in Union Square Park. Huxtable continued to discuss historic preservation into her later life. She used the campaign to save 2 Columbus Circle to argue that an intransigent approach to preservation is not beneficial. “One wonders at what point New York's civic groups lost their vision, just when they decided nostalgia and trendy revisionism overrode a positive contribution to the city's cultural and architectural quality. "14 This campaign in particular led Huxtable to write about what she considered to be the negative aspects of preservation. She pointed out the existence and problem of preservation for the sake of preservation. “There is a great deal more at stake than this one building. When preservation distorts history and reality in a campaign of surprising savagery, it signals an absence of standards and an abdication of judgment and responsibility. It has lost its meaning when we prefer a stagnant status quo. "15 She fought against preserving the facade of 2 Columbus Circle: "Inspection has found the facade so badly deteriorated that it can't be saved; it would have to be rebuilt—a copy or reproduction would have to replace it. "16 The campaign to save 2 Columbus Circle was ultimately unsuccessful. Anthony C. Wood, Preserving New York: Winning the Right to Protect a City’s Landmarks (New York: Routledge, 2008), page 265. Anthony C. Wood, Preserving New York: Winning the Right to Protect a City’s Landmarks (New York: Routledge, 2008), page 284. “Farewell to Penn Station,” The New York Times, 30 October 1963. “Landmark Legislation,” The New York Times, 3 December 1964. “Anything left to preserve?” The New York Times, 24 September 1964. “Saving Carnegie Hall,” The New York Times, 21 March 1960. “Every Foot of the Park,” The New York Times, 19 April 1960. “Atrocity at Union Square,” The New York Times, 29 June 1962. Ada Louise Huxtable, ” The Best Way to Preserve 2 Columbus Circle? A Makeover,”The Wall Street Journal, 7 January 2004.